LG posted its third quarter 2013 earnings on Thursday, noting $12.51 billion in revenue, up 27 percent over the same quarter last year but missing street estimates, and a declining $195.34 million in profit. While the company saw some gains year-on-year in a few sectors, it mostly saw sales declines quarter-over-quarter. LG's mobile division reported $2.75 billion in revenues and a $75.3 million loss ($80 billion Korean won) on 12 million phone unit shipments. The company blamed the falling profits on an "increase in marketing expense" for its G2 smartphone and a decrease in average sale price as competition heats up. "LG plans to focus on increasing sales of new premium products such as the LG G2 smartphone during the peak holiday season as well as maximizing 3G and mid-tier mass devices such as the L II Series and F Series," LG said. The company's LCD display business is also struggling. The company noted a seven percent decrease in revenue from television sales, with $4.5 billion in revenue recorded for the quarter, despite increased sales in developing markets. LG warns to expect a decrease in year-on-year sales for LCD TVs, despite an expected increase in demand during the upcoming holiday season. Additional information, such as performance in LG's air conditioning and home appliance businesses, can be found in the release below. SEOUL, Oct. 24, 2013 — LG Electronics Inc. (LG) today announced third-quarter 2013 consolidated revenues of KRW 13.89 trillion (USD 12.51 billion). While competitive conditions in the TV sector and an unfavorable foreign currency exchange rate affected overall revenues compared with the 2012 third quarter, sales of mobile devices increased year-over-year by 24 percent. 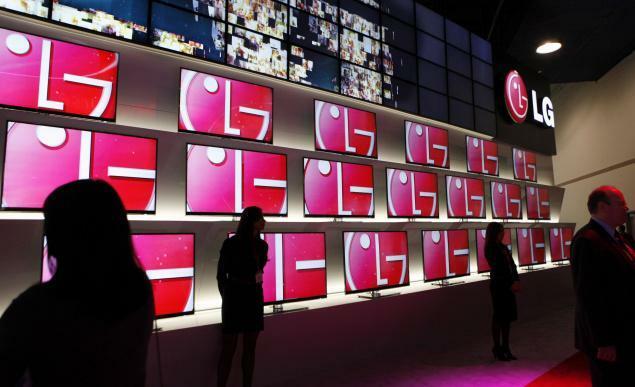 LG saw a 27 percent increase in third-quarter operating profit to KRW 217.80 billion (USD 196.34 million) compared with the same period last year. The LG Mobile Communications Company's third-quarter revenues increased by 24 percent compared with the same quarter a year ago to KRW 3.05 trillion (USD 2.75 billion). The company shipped 12 million smartphones in the third quarter but profitability and average selling price were affected by increased competition and higher marketing investments. LG plans to focus on increasing sales of new premium products such as the LG G2 smartphone during the peak holiday season as well as maximizing 3G and mid-tier mass devices such as the L II Series and F Series. 2013 3Q Exchange Rates Explained LG Electronics' unaudited quarterly earnings results are based on IFRS (International Financial Reporting Standards) for the three-month period ending September 30, 2013. Amounts in Korean won (KRW) are translated into U.S. dollars (USD) at the average rate of the three-month period of the corresponding quarter — KRW 1,110 per USD (2013 3Q). Earnings Conference and Conference Call LG Electronics will hold a Korean language earnings conference on October 24, 2013 at 16:00 Korea Standard Time at the LG Twin Tower Auditorium (B1 East Tower, 20 Yeoui-daero, Yeongdeungpo-gu, Seoul, Korea). An English language conference call will follow later at 21:00 Korea Standard Time (12:00 GMT/UTC). Participants are instructed to call +82 31 810 3069 and enter the passcode 9084#. The corresponding presentation file will be available for download at the LG Electronics website (www.lg.com/global/ir/reports/earning-release.jsp) at 14:00 on October 24, 2013. Please visit http://pin.teletogether.com/eng/ and pre-register with the passcode provided. For those unable to participate, an audio recording of the news conference will be available for a period of 30 days after the conclusion of the call. To access the recording, dial +82 31 931 3100 and enter the passcode 142710# when prompted.